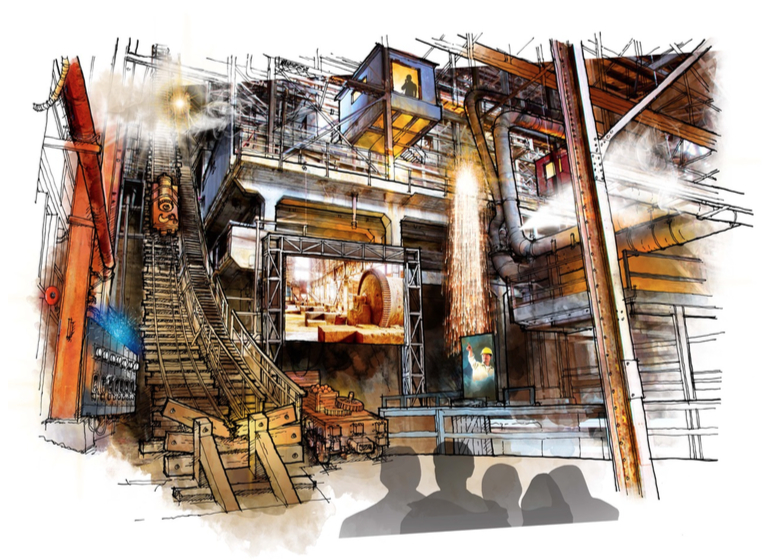 Vancouver’s Britannia Mine Museum is unveiling the concept designs for the upcoming Mill show experience, a new feature attraction and immersive multi-sensory show that brings the 20-story Mill building and National Historic Site back to life. Launching Spring 2019, the new Mill show experience tells the captivating story of the wide-ranging importance of the historic Mill building when it was fully operational from the 1920’s until its closing in 1974. “We are excited to unveil the designs of our new Mill show and share the significant role it played in B.C.’s and Canada’s history and economic success,” says Kirstin Clausen, executive director of the Britannia Mine Museum. A National Historic Site and one of the last remaining gravity-fed concentrator mills in North America, the 20-story Mill building is an awe-inspiring, rock-hugging building that has been the symbol of Britannia throughout the years. The Mill literally “rocked and rolled” when it was in production as it received raw ore from 200 km of underground tunnels and produced copper and zinc concentrates to be shipped elsewhere for processing into metals. The Mill was both literally and metaphorically a beacon to the economic well-being of the communities in the Howe Sound region. In fact, the Britannia Mine was the largest copper producer in the British Empire in the late 1920s. Rehabilitated in 2007, each of the Mill’s 14,416 panes of glass was hand-puttied into the frames to maintain its heritage and the building can be seen from miles away from the waters of Howe Sound. The new Mill experience show also features the work of Dynamic Attractions, a Port Coquitlam based company specializing in building some of the world’s most iconic and award–winning amusement theme park attractions and structures. Dynamic Attractions will be engineering and fabricating a movable skip for the Mill show which will demonstrate how mining equipment was hauled up and down the 20-story Mill building. Dynamic Attractions has created ride systems and attractions-related products in the US, Asia, the Middle East and Europe, but never in Canada.Dynamic is comprised of approximately 350 innovative engineers, highly–precise fabricators and other specialists. The Britannia Mine Museum provides fun, unique and memorable experiences that engage visitors of all ages including educational exhibits and crowd favorites like the underground mine train, gold panning, machine shop, and the Beaty-Lundin Visitor Centre where they can learn about Britannia’s history. The new Mill show experience and the additional rehabilitation of the Museum’s infrastructure were made possible by a $1.4 million funding contribution by the Government of Canada under its New Building Canada Fund, alongside another $2.8 million the Museum has fund-raised from a supportive BC mining industry and the Provincial Government of B.C. Vista Collaborative Arts is the production company behind the Mill experience show.